This past April I enjoyed a week-long trip to Berlin; my first in that amazing city. Perhaps most striking is the contradiction of old and new which influences every dimension of the city from culture to architecture to art to the very people themselves. One can’t help but be captivated by the combination of old and new architecture. Since German reunification and as the result of fierce bombings during WWII, the city has undergone an architectural transformation. 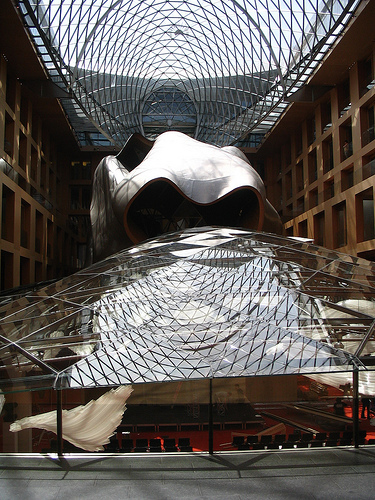 Nearly every major contemporary architect has a building represented in the city: I. M. Peis’ German Historical Museum, Frank Gehry’s DZ Bank, Helmut Jahn’s Sony Center lead the way. 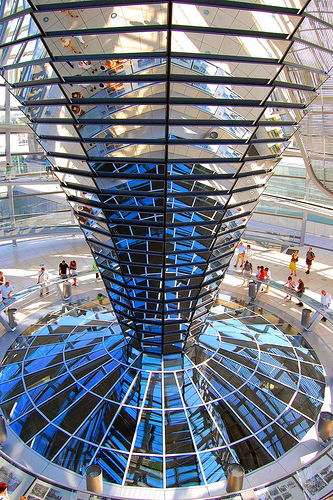 But one need only visit the government buildings, particularly the Reichstag whose dome was designed by Norman Foster then look at the surrounding plaza of buildings designed by Stephen Braunfels to get a glimpse of how the Germans embrace contemporary architecture. 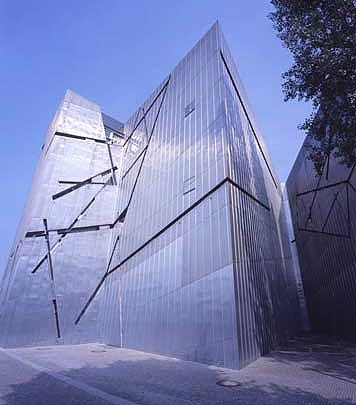 While the museums are a showcase of old and new, witness the Pergamon with its antiquities; the Jewish Museum designed by Daniel Libeskind and the Holocaust Memorial conceived as 2700 graves under the sky conceived by Peter Eisenman provide a stark contrast. In addition to the obvious historical sites, I was astounded by the ease of travel given the infrastructure. A simple underground, known as the U-bahn was supplemented by the S-bahn, elevated tracks, in addition to cable cars, and busses on nearly every corner with a full compliment of taxis, etc. It seemed a shame that in a country which manufactures both Mercedes and BMWs that one would never need a car to get around their largest city. Likewise, the museums provided a full range of art offerings, from a bust of Nefertiti to the most contemporary Berlinische Galerie www.berlinischegalerie.de where I saw the silhouette of an airplane created out of a Persian run entitled “Flying Carpet” by Alex Flemming along with a large painting created of cassette audio tape cases—all works collected and produced since 2002. One day I spent just touring art galleries, about 30 in all, focusing on two of the five art districts in Berlin. One of my most interesting finds was the work of a recent art school grad that focused on how people need to cooperate to communicate. Valentin Hertweck at www.gitteweisegallery.com showcased “Legato” a fully set table for six, where all utensils and glassware needed to be used simultaneously for a successful dinner party. Yukiko Terada at www.deschler-berlin.de has on display her works cut from textiles—a gigantic functional T-shirt and a shopping bag with wheels, with a plaid dog cut right from the same cloth. I was lucky enough to see another artist known of his work with textiles, Daniel Buren at www.buchmanngalerie.com where he had blue and white and green and white sailcloth strips extended over fans all blowing in harmony entitled “Westwind.” At www.aurelscheibler.com I was intrigued to find the work of Thomas Rentmeister, known for his sculptural work with vast quantities of Styrofoam and nutella who had “replastered” the entire back wall of the gallery with this mixture of white and chocolate, providing a background for his newer works using Q-tips, cotton balls, and sugar cubes glued together with a yellow glue. His use of everyday materials was an interesting commentary on his pursuit of art. I could also write volumes on the not-so-distinguished art I saw, painted two by fours, disappointing videos, ceramic figures with long red noses, and piles of plastic tubing. I’ll refrain from dismissing these as art and just keep them in my memory bank as making the trip a worthwhile endeavor and furthering the dynamic contrasts I witnessed during my trip. 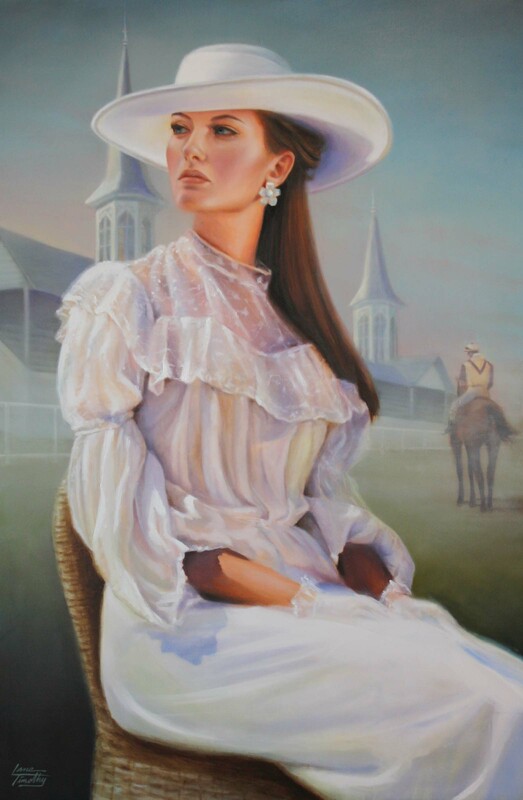 By Clark Olson / Co-owner Bonner David Galleries, Communication Professor Arizona State University, Phoenix Art Museum Senior Docent and world traveler. "Nature's Magic" by Jane Jones-First Public Release! We had a wonderful time last night with Jane Jones at the opening of her latest collection “Nature’s Magic”. The show will hang through June 16, 2010. While we would love for everyone to visit the gallery to experience the true essence of Jane’s work, we understand that in our global era, this is not always possible. We don’t want anyone to miss out on the Magic of Jane Jones! Click on the link below to view the full collection. What do monsters, martinis, and a vacuum cleaner have in common? 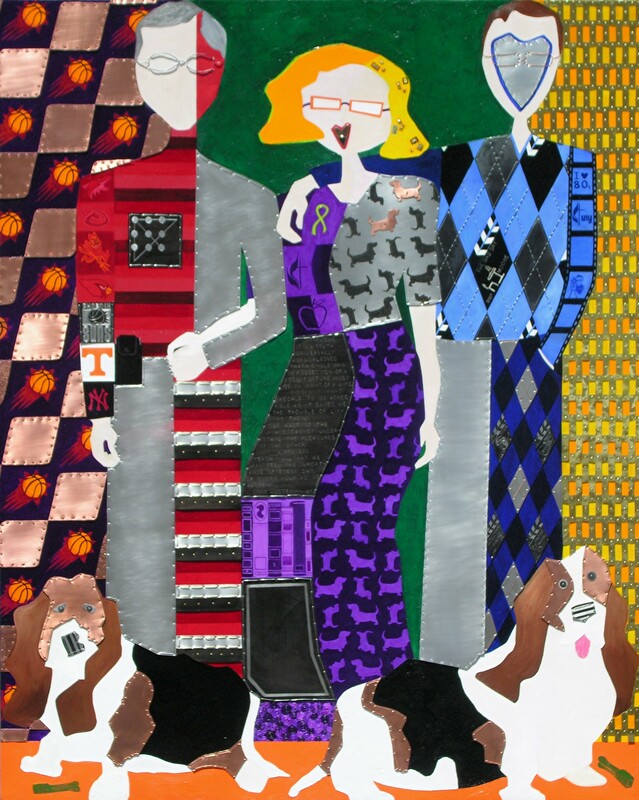 They are all part of the new collection from contemporary artist Henry Stinson! For those familiar with his work this should come as no surprise. For those who aren’t… welcome to extraordinary world of Henry Stinson! 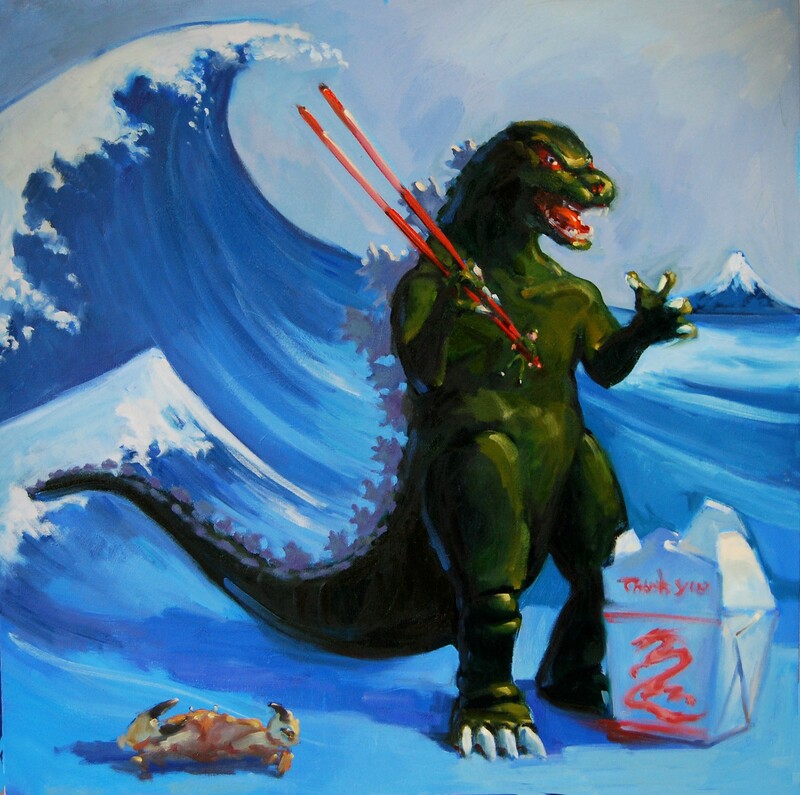 The imagination and passion he illustrates with each painting sheds new light on a life filled with wit, satire and childhood nostalgia. Stinson’s story is nothing short of remarkable. Born in Anchorage, Alaska and growing up in the Pacific Northwest, his life and art were literally electrified at a young age. His experience being electrocuted behind the family sofa (more on this later) helped him develop an appreciation for the moments in life that linger in our minds. He strives to captures these memories through his work, redefining the obvious with vibrant colors and playful imagery. Henry started his formal training at Washington State University where he pursued a Bachelor of Fine Arts, focusing on sculpture. Continuing his education he attended The Art Institute of Seattle, as well as completing an intensive four year apprenticeship with master impressionist Ron Lukas. In addition, Stinson spent the past 17 years teaching, hosting workshops, and creating on his own vivacious works of art. While his formal education has undoubtedly shaped him into the extraordinary artist he is today, what ultimately defines Stinson’s work is his subjects. 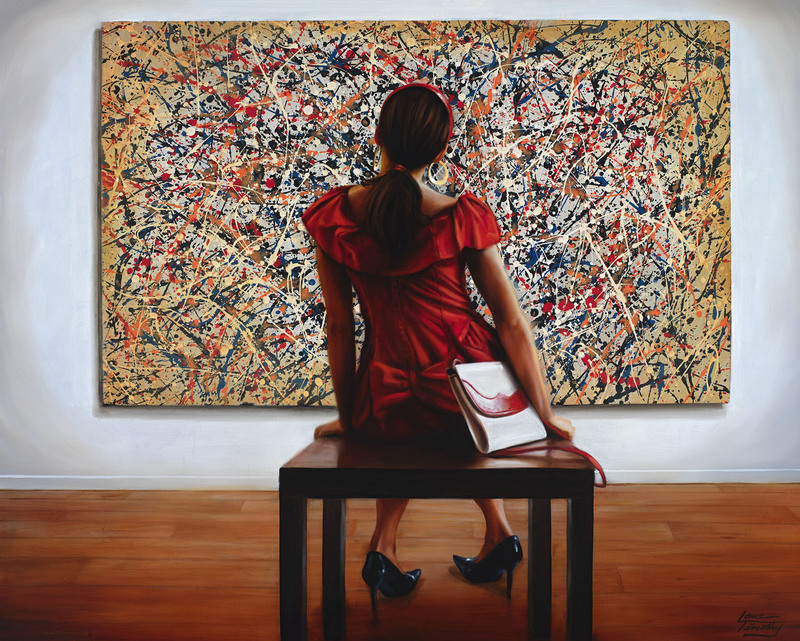 “Playful,” “Introspective,” and “Humorous” is how he describes his latest paintings, ingenious is what we think. BGD: Is there a person or hero in your life who inspired you to pursue the path of artist? Stinson: I have been inspired by many different artists throughout the years, but also starting way back at an early age watching cartoons. BDG: Ah, so…cartoons were a big influence? Which one was your favorite? Stinson: Mostly old Warner Bros. cartoons created by Chuck Jones, but I also love Ren and Stimpy, it’s one of my favorites. *for those non-cartoon buffs, Chuck Jones created some of our all time favorite characters like Roadrunner, Wile E. Coyote, Marvin the Martian and Pepe le Pew, just to name a few. BDG: We love Ren and Stimpy! So, which one would you say you identify with the most? Stinson: Definitely Ren! I’m much more like Ren than Stimpy. Stinson: Pull up a lawn chair and watch… and hope he doesn’t step in my yard. BDG: Wonderful…we would definitely join you for that! BDG: “Bad Boys and Girls” is a collection of iconic characters from old sci-fi and B movies. Did you have figurines for those paintings or did you use photos? 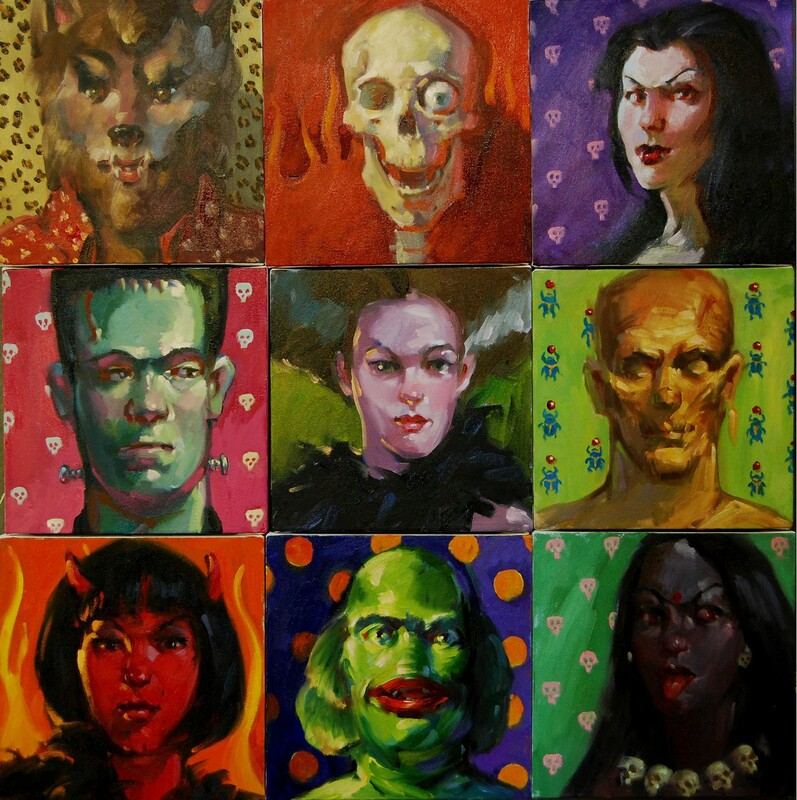 Stinson: No, I looked up images online and watched them on T.V., then went to my studio and painted them from memory. BDG: So you do not use photographs, you mentioned that in your American Art Collector article, why is that? Stinson: I would much rather work from memory. Why even try to copy a photo? I just think that not everything has to be perfect. BDG: Ok, so the burning question. You also mentioned in the American Art Collector article that you were electrocuted when you were 5 years old. We just have to know…what were you doing? Stinson: I was behind the couch playing with a fork lift toy. The light cord was plugged into an extension cord and I wasn’t strong enough to pull it out with my hands, so I held one of the cords with my mouth and pulled. I stripped the cord with my teeth, burned off my bottom lip, and that was all I remember. My heart stopped and I died. It was one of those out of body experiences. I saw the tunnel of light and everything. I really have no physical memory of the pain, though. Last thing I remember was starring up at the ceiling. BDG: Wow that is an incredible story. Do you think that experience has influenced your life and your art? BDG: Would you say that’s your motto in life? Stinson: Yes. You just have to find humor in life. “Stumbling Toward Enlightenment” new works by Henry Stinson will debut with joint works from Lane Timothy on Thursday May 13, 2010 from 6:00-9:00 pm at Bonner David Galleries (Map). This is a remarkable and energetic collection. We invite everyone to join us for the opening and meet artist Henry Stinson, in the flesh! Look for Henry Stinson in this month’s issue of American Art Collector ! It appears as though Mitch Fry has been up to something quite intriguing in his studio. One might ponder the countless projects taking place behind those walls. The large size of the studio itself excites the imagination to the possibility of something spectacular emerging. With a background in handcrafted furniture Mitch is no stranger to fine woodworking. Eight years ago Fry opened a custom furniture shop, but with the recession offering less opportunity for him to share his craftsmanship, he dedicated himself to his art. 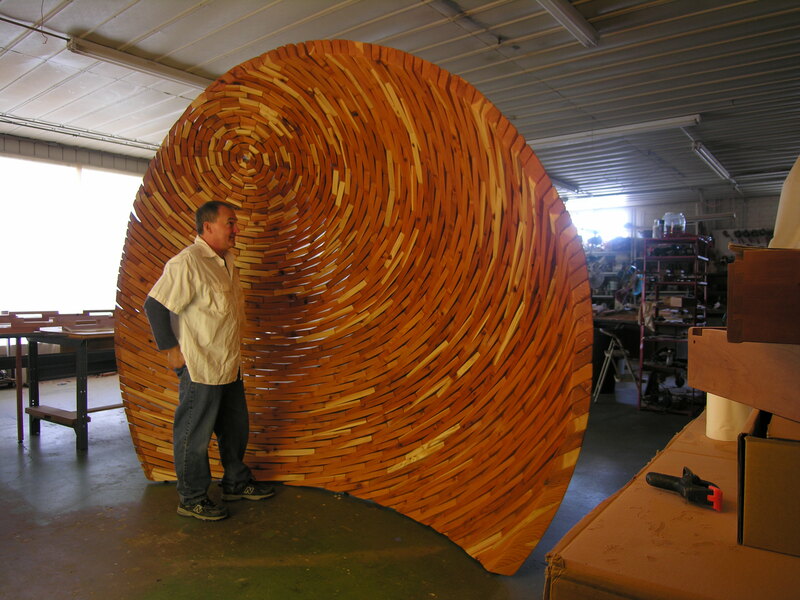 Fry’s passion for sustainable building has produced a stunning and unimaginable piece of art. 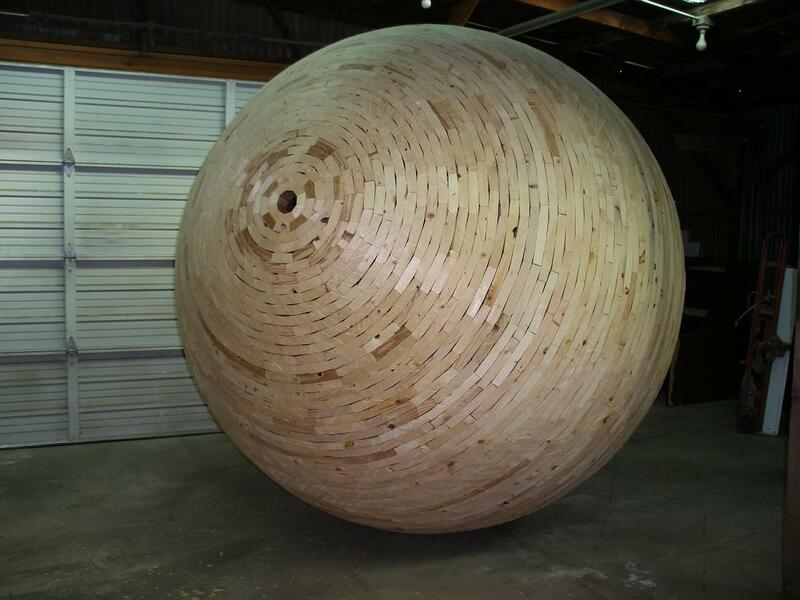 The completed work revealed a 900-pound wooden sphere measuring 8-feet in diameter! Constructed bit by bit using precise calculations, Mitch formulated the sphere using a good old calculator, drafting table, and a lot of patience. Each piece of wood was first cut into a small block, then measured and cut again to match the exact specifications of the formula. Fry admits that the challenge of fashioning a perfectly round sphere from linear pieces was inviting at first; but creating a simple form from seemingly simple calculations, turned out to be quite a complex process. 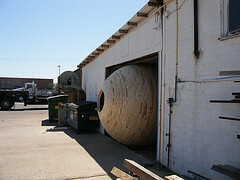 The project won Mitch a grant from The Contemporary Forum, a support organization of the Phoenix Art Museum. Now Fry has the opportunity to create a work to be displayed at the museum in May. 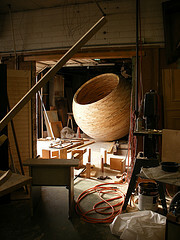 A plan to recreate the sphere using the same principles of sustainability is literally in the woodwork, using redwood from renewable lumber forests. We want to congratulate and honor Mitch for creating work that inspires us all to rethink our approach to sustainable art. The sphere is stunning, elegant, simple, and yet extravagantly complex. You truly must experience if first hand. So where can one witness the magnitude of this work of art? 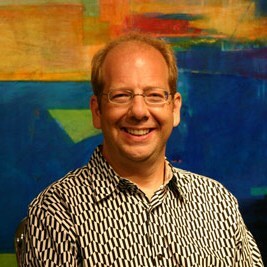 Mitch Fry will be accepting his award at the Contemporary Forum’s Annual Meeting and Awards Presentation on May 12th, 2010 at the Phoenix Art Museum at 7:00 p.m. This event is open to the public and we invite everyone to join. The exhibition will run for about a month and can be viewed in the Rineberg Gallery. "Moore Family Visual Biography" Revealed! The unveiling was a huge success. Family and Friends showed their support and we all tried to hold back our tears of joy as Clark and Max rolled away the wall the to reveal the finished painting. As many of you know, this project took almost two years to complete. We are happy to announce that the Moore Family could not have been more pleased with the final work of art! Go to our Facebook page to see photos and highlights from the evening!